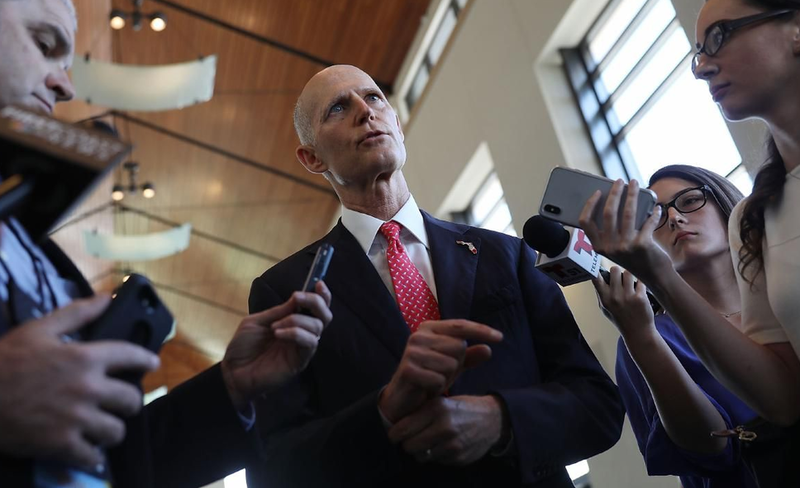 The Republican governor of Florida, Rick Scott, filed additional lawsuits against the electoral authorities of two districts. According to Mr Scott invalid votes are being counted. Mr Chris Hartline, a spokesman for Scott's campaign, said in a statement: "the Broward and Palm Beach County Supervisors of Elections has already demonstrated a blatant disregard for Florida's elections laws, making it more important than ever that we continue to do everything possible to prevent fraud and ensure this recount is operated responsibly." His Democrat rival Mr Nelson said Governor Scott was panicking: "If Rick Scott wanted to make sure every legal ballot is counted, he would not be suing to try and stop voters from having their legal ballot counted as intended." "He's doing this for the same reason he's been making false and panicked claims about voter fraud - he's worried that when all the votes are counted he'll lose this election." “Broward Elections office admits the vote count they submitted to state includes 22 illegal votes,” Florida GOP Senator Mr Marco Rubio stated. Appearing on Fox news, Governor Scott said Sunday that Mr Nelson wants fraudulent ballots to count, pointing to a Nelson lawyer objecting to Palm Beach County's rejection of one provisional ballot because it was cast by a noncitizen: “He is trying to commit fraud to win this election. Bill Nelson's a sore loser. He's been in politics way too long." The recount creates tensions in Florida. Activists, lawyers and candidates question the election process, as does Governor Scott, who announced that he wants to bring three lawsuits against two districts in Florida. The first complaint is against the head of the electoral authorities in Broward County. According to Mr Scott, she counted a number of votes after the deadline for submitting the unofficial results had already passed. Governor Scott asked the electoral authorities of Palm Beach County to confiscate the counting equipment as soon as the recount is finished and to keep all ballots and reports.